Large quantity discounts (100 copies+) are available. To inquire, please contact us by email (extstore@iastate.edu) or calling (515)294-5247. All images from this publication can be purchased by visiting our Digital Media section. Requests for permission to repost, reprint or use content of ISU Extension and Outreach publications. 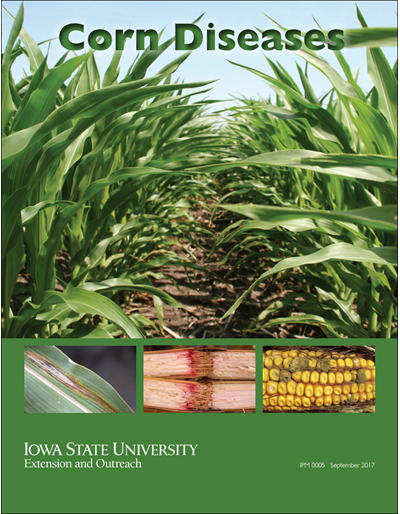 This fully revised booklet helps corn producers and other professionals in the agriculture industry identify and scout for corn diseases and provides general recommendations for management. Also included are illustrated disease cycles for primary diseases, a foliar disease estimation chart, and corn growth and development and staging information. Looking to purchase multiple copies? 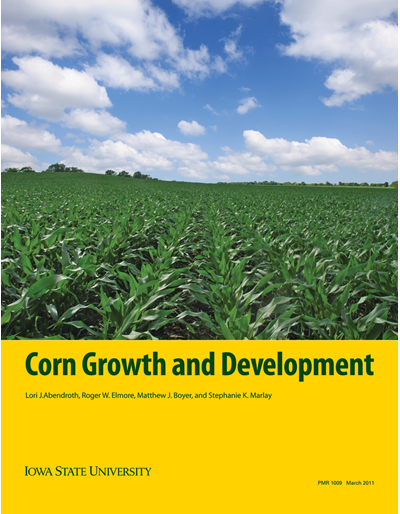 Corn Diseases is also sold in boxed quantities of 50 at a reduced price ($3.50/copy). 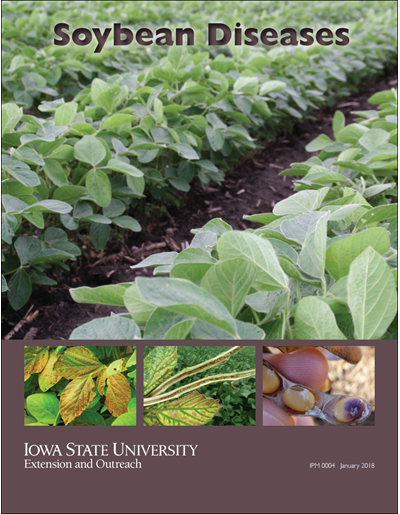 This fully revised booklet helps soybean farmers and other professionals in the agriculture industry identify and scout for soybean diseases and provides general recommendations for management. Also included are illustrated disease cycles for many diseases, a foliar disease estimation chart, and soybean growth and development and staging information. Looking to purchase multiple copies? 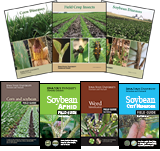 Soybean Diseases is also sold in boxed quantities of 50 at a reduced price ($3.50/copy). 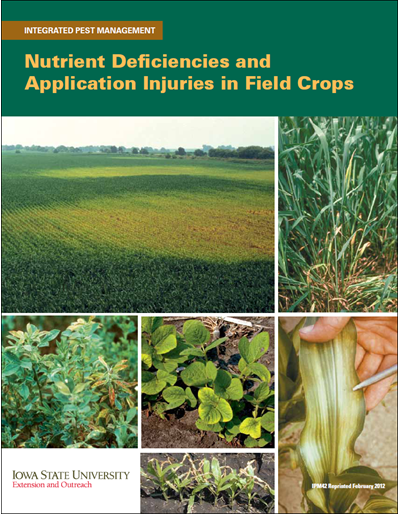 Color photos and descriptions aid in identifying nutrient deficiencies and injury due to fertilizer in order to accurately diagnose symptoms for corn, soybeans, alfalfa, and winter wheat. Manure has characteristics that make nutrient management different and sometimes more complicated than fertilizer. Find out about manure nutrient availability for crops, manure nutrient supply, manure nutrient application recommendations, adjusting for manure nitrogen volatilization, and more. High crop residue levels translate directly into soil conservation benefits. Includes what affects crop residue and four methods of measuring it. Buffers are designed to intercept sediment and nutrients and reduce soil erosion; they also help enhance air and water quality and fish and wildlife habitats. Learn how to understand, manage, and maintain conservation buffers. 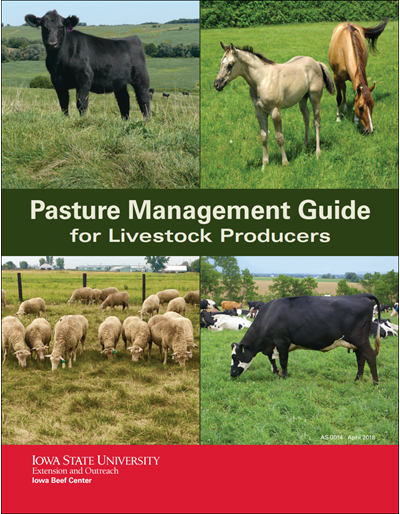 Completely updated and revised, this guide provides a general pasture management reference for livestock producers, agriculture advisers, teachers and students. The color publication covers practices to increase production and returns by improving management of grassland.